$11.00 for $24.00 - $11 for 120 Minutes of Jump Time (Mon-Thurs)! $15.00 for $24.00 - $15 for 120 Minutes of Jump Time (Fri-Sun)! CHECK OUT THEIR NEW NINJA COURSE! Tons of Fun and Plenty of Activities for Children and Adults of all Ages! 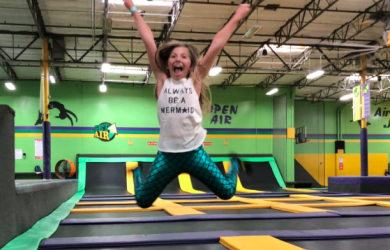 Get Air Facilities offer: Big Air Trampoline, Kiddie Court, Dodge Ball, Foam Pit, Slam Ball, and More!! 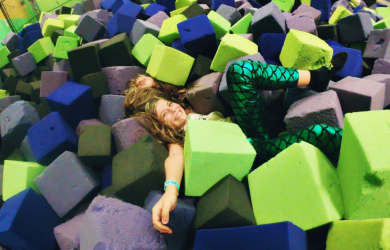 Jump into Get Air's Ultimate Foam Pits! The pits give you a soft place to land! Dunking just got a whole lot easier with Get Air's Basketball Trampoline Court. Get some lift to your game! You'll find Vertical Trampolines, Basketball Courts, a Dodge Ball Area and Individual Trampolines in the Main Court! Massage Chairs to Enjoy after a Jump Session or Just to Relax and Unwind! Expires Feb. 28, 2019. NO Cash Value! Limit 1 Per Member Per Visit. EXCLUDES Holidays. Not to be Combined with any other Offer! Offer valid for ONE person only. Voucher cannot be split between multiple people. Must use all two hours in one visit.